Across the US, homeowners report spending around $750-3,000 on deck replacement cost, depending on project size and materials. 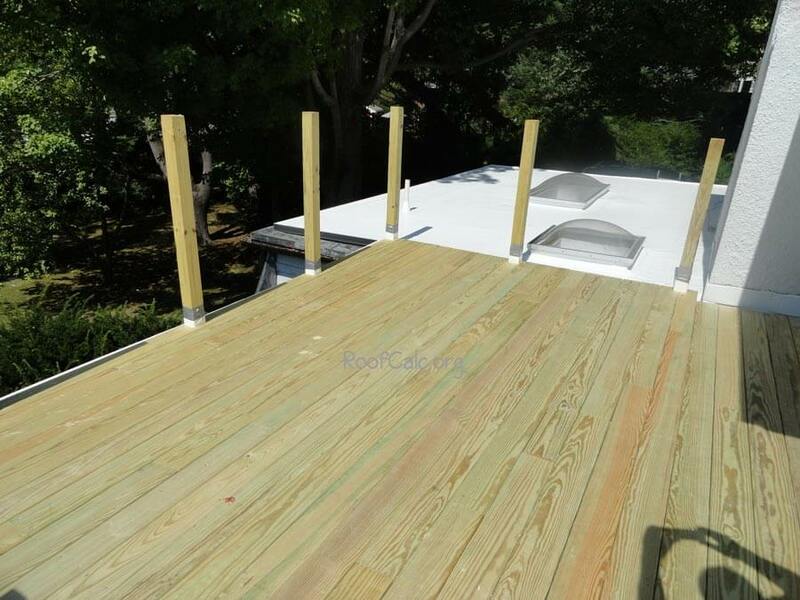 In fact, the price range is so spread out, because the quality of deck materials ranges from very low to top notch. EPDM rubber is at the lowest end of the price spectrum. 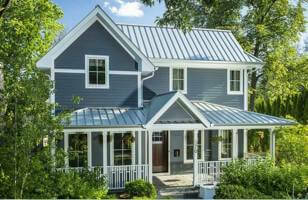 Average deck cost is $700 – 900 per 100 sq.ft. 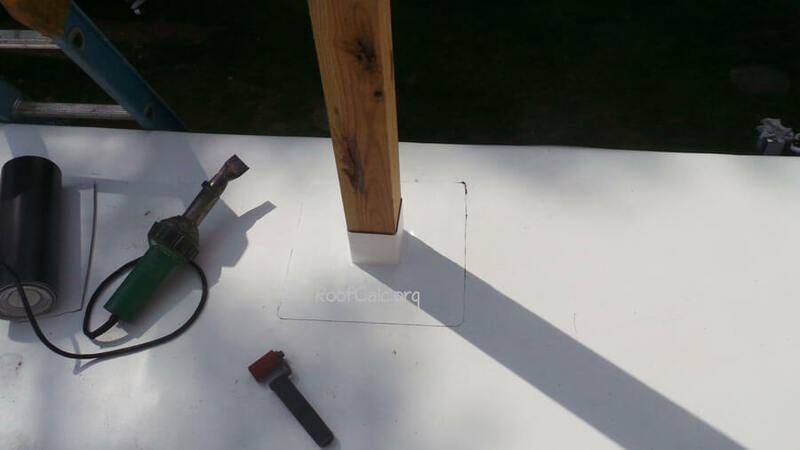 So if your roofing deck is 300 sq.ft. you will pay $2,100-2,700 total. At the highest end of the price range is 80 mil PVC membrane. 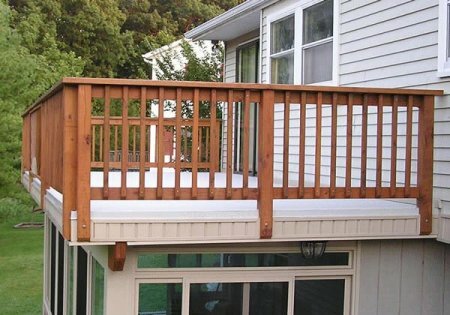 PVC deck cost per square foot is $9-12. You are looking to spend about $900-1,200 per 100 square feet installed. So 300 sq.ft. will cost $2,700-3,600. This estimate includes slippers, and all necessary penetration flashings. TPO falls somewhere in the middle, costing about $800-1,100 per 100 sq.ft. 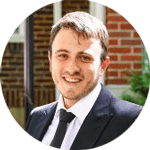 Thus, the difference between the cheapest and most expensive option is $600-900 As we will review the multiple problems that await you with rubber decking, it will hopefully be clear that this initial savings is not worth the long term troubles and expenses. If you want the best deck material, there are two high quality membrane options, which have pre-molded flashings – PVC and TPO. However, TPO does not have square post flashings, so you still need to use uncured material and stretch it around the posts. PVC decking, on the other hand, comes with a wide array of different sizes of square / rectangular and round flashings, that are heat welded, easy to install, and will not shrink. Note, that all flashings are heat welded. Hot air melts the membrane, and the installer compresses two pieces with a hand roller, creating a permanent bond, that will not come apart with time. In fact, not only flashings – all seams, roof to wall connections, even the metal drip edge, are all welded together to create a fully seamless roof that is impervious to moisture. 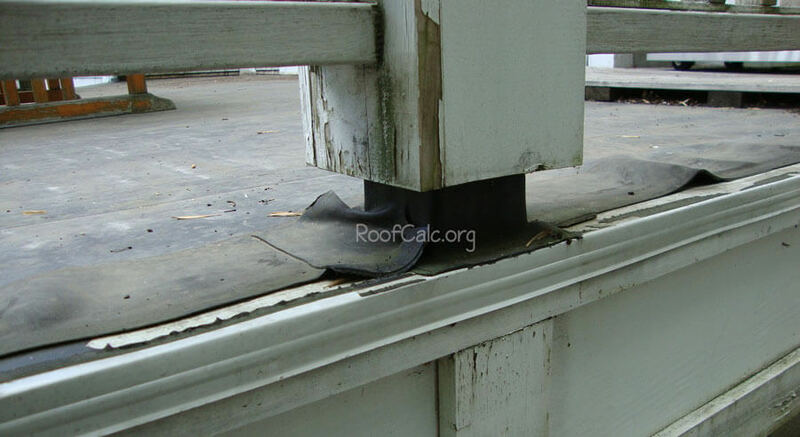 Once all seams are heat welded, slippers are installed between deck rafters and roof surface to protect the membrane. Then, a frame is built on top, and pressure treated or composite decking is installed. 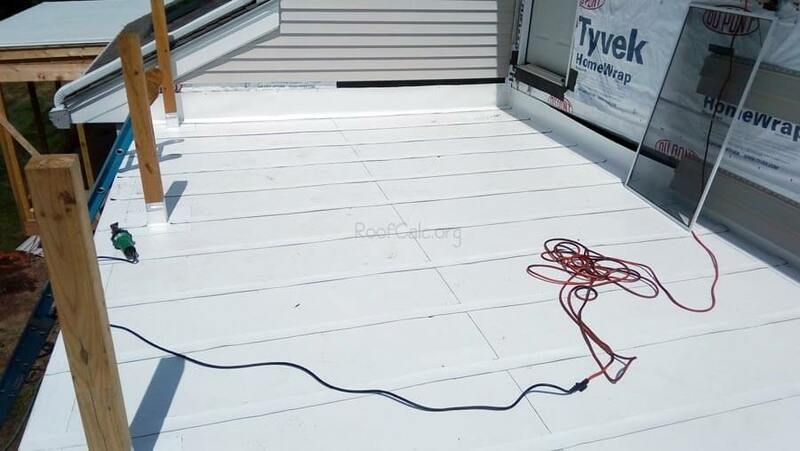 PVC roof is easy to fix – in the summer or winter, dry or wet! Ease of repair is one of the best features of a PVC membrane, in my opinion. Any punctures can be simply re-welded or patched in any weather condition. Once, we had to do a PVC install and it started snowing, while all our seams were still unfinished. We were able to easily, albeit uncomfortably weld all seams, even as they were getting wet. The hot air blows all moisture from the membrane surface, and heats it up enough to melt. If it’s really cold, we simply increase heat gun temperature, to make sure we don’t have cold welds! Below are the jobs that we did, replacing various types of flat roofs. Most of them failed due to ponding water! The roof above is 3 ply mod-bit – thick bitumen membrane, that is very puncture resistant, but cannot stand up to ponding water. Seams “torched” together, and any kind of debris in seams will cause delimitation and leaks. Mod-bit is very heavy, and on this job, the homeowner had to pay $1,500 in dumpster fees alone! Above you can see a leaking deck made of EPDM Rubber, with a completely destroyed room below it. 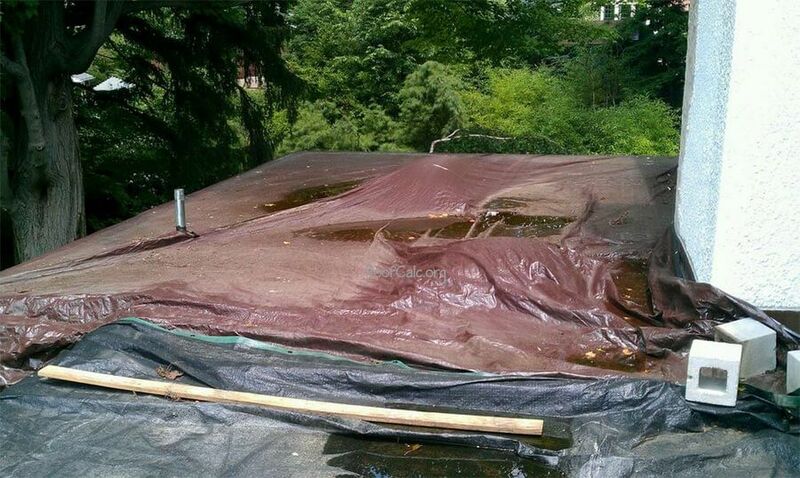 This rubber roof is only 3×6 feet – yet the damages it caused exceed $10,000! Unfortunately, the “natural” choice for many contractors and homeowners looking to build a roofing deck is to go with a rubber membrane. This is because it’s the only option that most people are aware of. 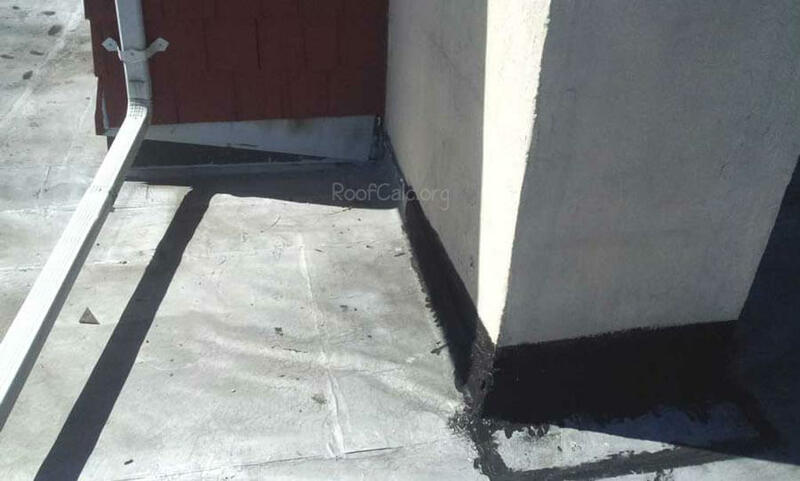 The problem with EPDM is that glued seams will eventually come apart, and if you have your composite/pressure treated deck over rubber, you will have to disassemble the entire structure to fix the leaks. Now you are out of $2,300-3,500 just to fix the leak in a rubber roof. 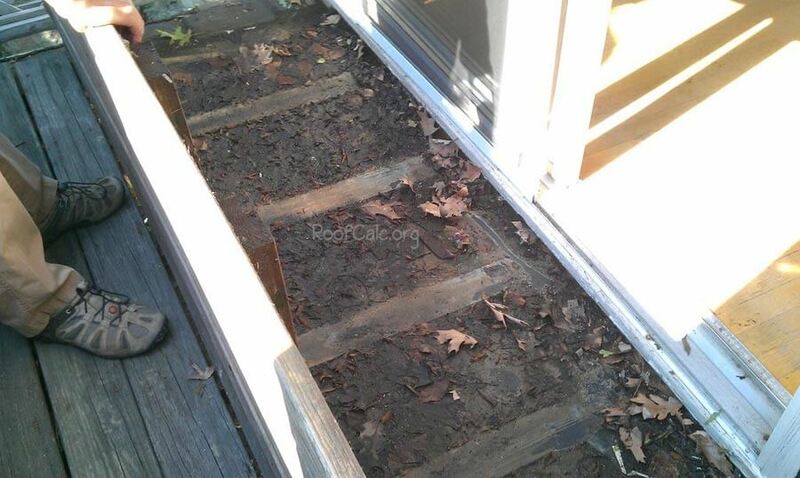 You may ask – why do you need to take the deck apart? Here is why: most likely, the rubber seams will be coming apart, and since rafters are laying perpendicular to seams, you need to take off ALL rafters. Even if it’s only post penetrations that need to be repaired – you still need to take off decking all along the outer edge of the roof. That is at least $500 in labor! Even worse is the situation with penetration flashings. The only option is to use uncured peel and stick material, which is stretched around the four corners of a 4×4 post, and is glued down. Uncured flashing tends to shrink back, and as a result, pulls off the roof surface, creating leaks. Since posts are typically located at the low point (along the outer perimeter), all the water simply runs down and leaks through these flashings. 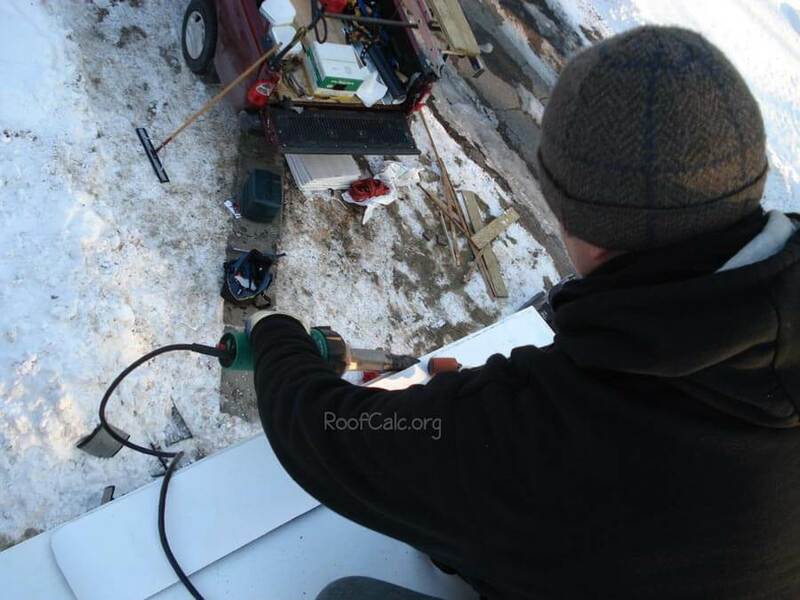 Ideally your roof should have a positive slope, with a fairly flat surface (no indents). 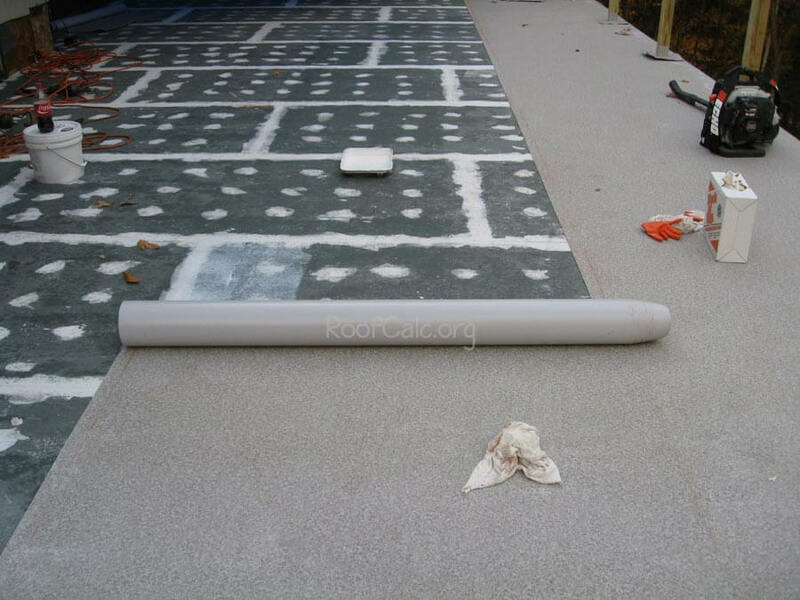 It is optimal to have 1/4″ per foot pitch on any flat roof. However, that isn’t always the case. 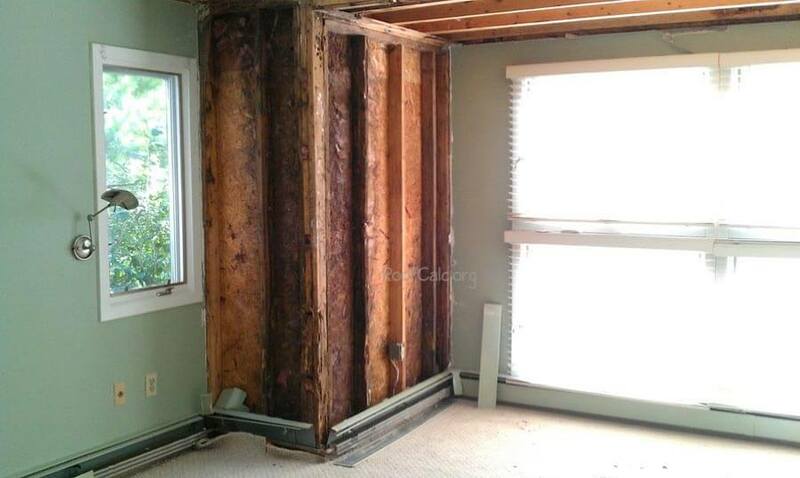 Foundations settle, rafters “bend”, or door openings are too close to the roof surface to increase the slope. As a result, many flat roofing decks have ponding situations, where water pools for longer than 72 hours after a big rain storm. On rubber / built-up and tar roofs, this often results in leaks. The ponding should (have) been addressed when the structure was built OR when the roof was replaced. In some cases it is very easy to increase slope with tapered insulation. However, depending on design limitations, this solution may not always be feasible. To compare, PVC decking can easily withstand pooling water. 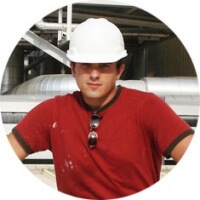 Since all seams are fully welded, even tiny leaks will not penetrate properly fused overlaps. So even if you have ponding water, and it’s not possible to increase the slope, PVC is the best choice in this situation. Deckshield (or similar products from other manufacturers) are fully adhered over DensDeck rigid substrate. It can be walked on, and you can put patio furniture on it, etc. It’s the same PVC material, only with added texture, created to prevent slipping. It also makes the surface look visually appealing. Once again all components are fully heat welded, so there will be no glue coming apart and no leaks. I have been in the flat roofing business for 15 years and I can provide 100s more proof photos. The choice is yours: save a few hundred now, and pay thousands later, or get the best deck material that you can. I’ve seen too many failed rubber roofs to even mention it as a viable (good enough) choice. Sure there will be roofers that swear by rubber, and will tell you that after installing it for 50 years they never had leaks. Its simply not true, because ANY glued field seam will break down and begin to leak. And it happens to all rubber roofs at 7-10 years mark (when installed correctly) and much sooner, if it was a hack job. My recommendation is to go with quality PVC material. You can choose TPO, but you may not get heat welded seams, which will result in the same problems that we have with rubber. Keep in mind that an IB deck, which is my personal favorite, is not the only quality PVC option. There is also Sarnafil and FiberTite … but the latter two are strictly commercial products, as they don’t have residential warranty. 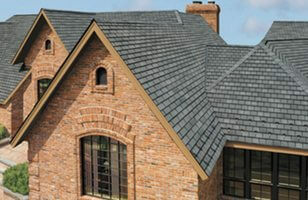 Besides issues we discussed that are specific to rubber roofing, the main cause of ANY leak is sub-par installation. 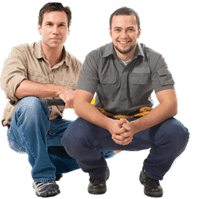 So be sure to hire only a pro who specializes in flat roofs – otherwise you will be dealing with repairs.